When children are young, finding words to pray can sometimes be challenging. This is the reason many of us know the faithful prayer “Now I lay me down to sleep…” Reciting prayers can be helpful for children to form words and habits of prayer. Encouraging your children to form their own words is truly wonderful, but for times they need a little help, a short memorized prayer is a great way to continue God-honoring behavior. Close your eyes. This is simply a sign of reverence. Fold your hands. This will help them stay focused. Or hold hands with family members. Doing this signals unity in prayer and love for family. Keep prayer reminders on the fridge- a great way to keep prayer a priority. Use prayer journals to track prayers and answers to prayers. Pray at the same time each day. Before meals and at bedtime have really worked for us. The above are just a few ideas our family has found to encourage prayer in the lives of children. I also wrote this child’s prayer of thanks. This short prayer can assist in keeping a positive attitude and remembering the Provider of all blessings. 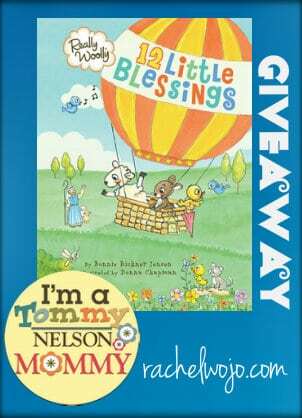 Today I have the most precious children’s book up for giveaway! 12 Little Blessings is a book about counting God’s provisions. Each page includes a Bible verse and a two phrase prayer, perfectly designed for children ages 3-7. Isn’t the Really Woolly brand sooo adorable? If you’d like to see more information or order this sweet DaySpring 12 Little Blessings book, click here. And if you want to tuck in the Jelly Bean Poem in your Easter baskets or to give away as sweet Gospel reminders, then click here for the free printables. But I KNOW you want to enter to win a copy of the book, so follow the Rafflecopter and I’ll see you tomorrow! I teach my children to pray and bless their food by example. Taking them to church and children’s church. Although my daughter is now 14 years old, daddy and I still cuddle up with her at bedtime. First we go over our day and talk about the positives and negatives of the day, and what we can do as we pray to change the negatives. Then we read a Bible verse and pray and say our “goodnight.” We all look forward to bedtime every day because it allows us to come together at the end of the day just to be together and share the Word of God as a family. Blessings! I have a golden book of prayers from years and years ago that we read, pray a few short sentences when we do bible reading and bedtime devotions. We also pray for meals. This book is too cute! My 3 year old son would love it! He has really been getting in to praying before dinner and bedtime. Attending Cypress and the childrens center has really help us with this. By example. It was funny the other day I had my hands folded up to my mouth for no reason and my daughter asked if I was praying. I need to be better though about making my girls pray more and for people. I love taking my daughter to church so she can learn about Jesus and we ask if the little one ever have any prayer requests and teach how important it is to pray. We also pray before every meal. Repeating the same pray night after night and then gradually adding special requests. the children to pray themselves. There are days I am in tears as they say the most precious prayers. oh I love that, Debbie! I have taught my children to pray by just speaking to the Lord with them. My children are adults, but I currently work with children in a bible study, and we teach them a simple prayer when they come to us and add new aspects as they grow older. I love each one of these gifts! I have a great niece who will be turning two in April. I want to teach her about Jesus. I hope I win! I also shared this link on my Heart Choices Facebook page. With my 3 year old, I think consistency is key. He knows our mealtime prayer by heart now and he enjoys naming off different family and friends names in our bedtime prayer. My husband I used to teach a small sunday school class of 9-10 year olds. When class started we’d ask each of them to think of something they’d like to pray for and then I would include them in our group prayer. I think getting kids involved is very beneficial as well.